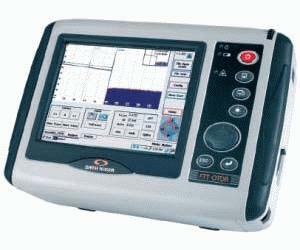 The FTT-1000 is an OTDR that is designed for field use that is compact, rugged, and splash proof. With excellent dynamic range that can measure >200 km of fiber length and small dead zones, the FTT-1000 can quickly find fiber faults. Its extended battery life allows >8 hours of continuous operation on a single charge. The FTT-1000 provides a large 6.4" full VGA, color touch screen with excellent visibility in bright sunlight, a field replaceable 8+ hour battery pack, Win CE operating system, and multiple I/O for data transfer — all in a weatherproof, rugged, field-ready package.